A blog born from the desire for a winter coat in a color other than black. With limited sewing experience and no knowledge of Japanese I've worked through all the patterns in Ryuichiro Shimazaki's book on men's coats. If I can do it, anyone can! But the challenges continue. Join me as I continue to explore the world of menswear. I AM my own luxury brand! Things are progressing nicely on the spring-y shirt. Cutting out the various pieces takes some thought and a fair amount of care, especially when working with stripes. 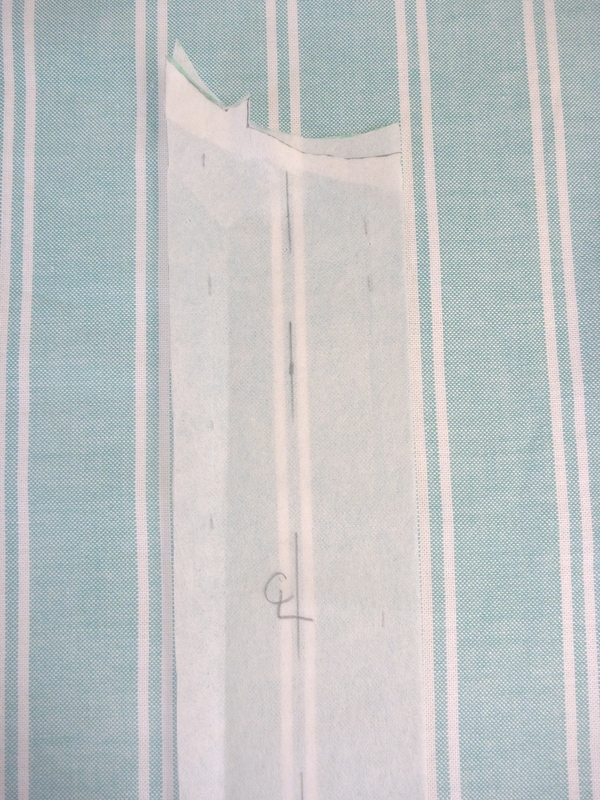 It took me awhile to wrap my head around the whole front placket matching, so hopefully this post can help some of you who may be contemplating a striped shirt. 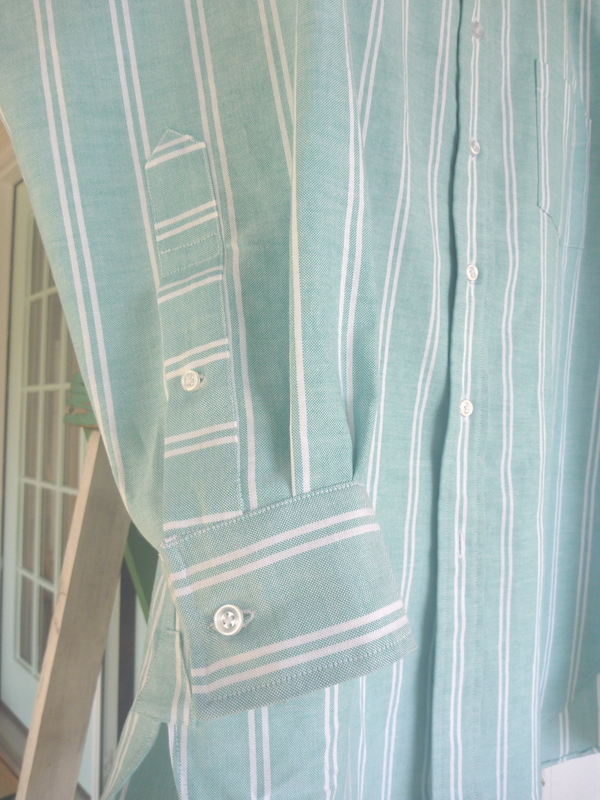 To make the stripes evenly spaced across the front of the shirt a dominant stripe of the fabric is "stacked" on three parts of the shirt (the placket, right and left fronts). All three pattern pieces must be cut out separately. Start with the placket. 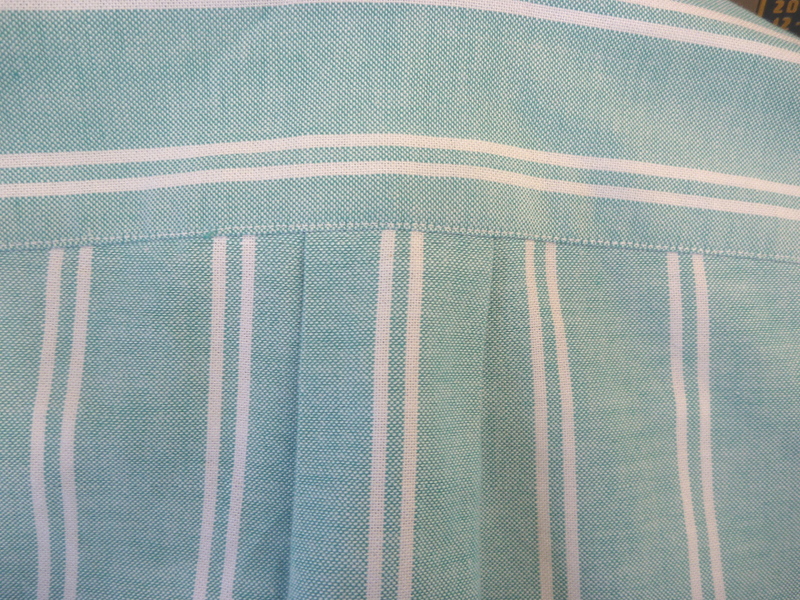 The dominant stripe of the fabric is placed along the centerline as shown above. 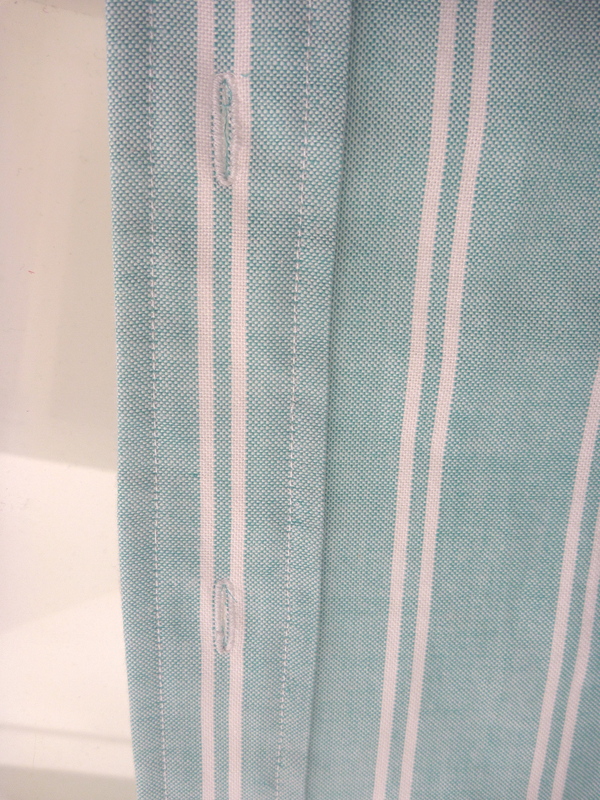 Eventually the buttonholes will be placed down the center stripe. 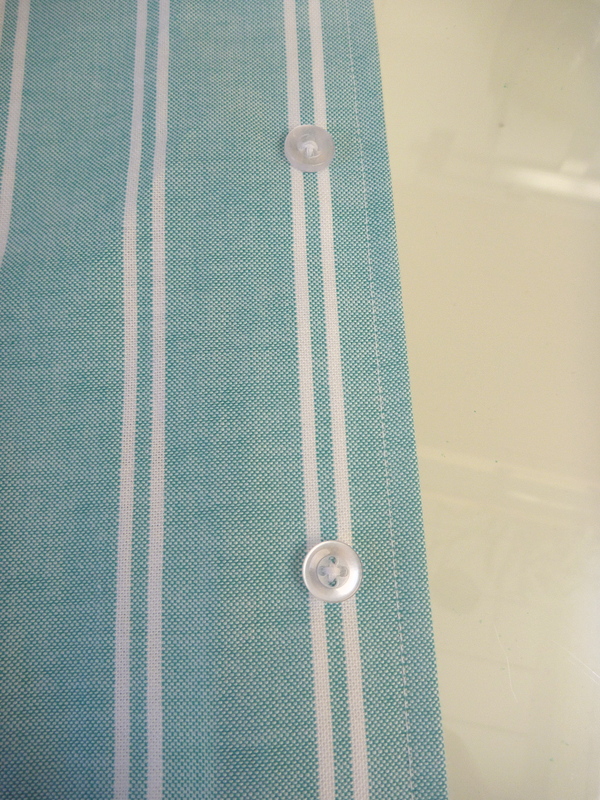 On the RIGHT side of the shirt the buttons will be placed on the dominant stripe that was chosen for the placket. 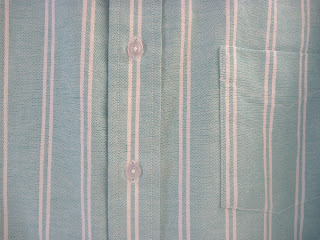 That way when the shirt is buttoned the center stripe of the placket is directly over the identical stripe on the right shirt front. 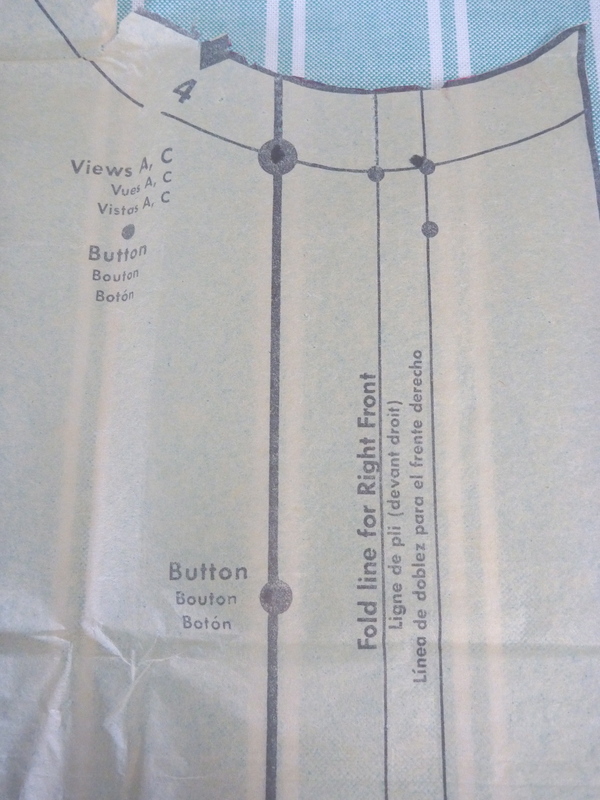 The button line is quite clearly marked on the pattern above. 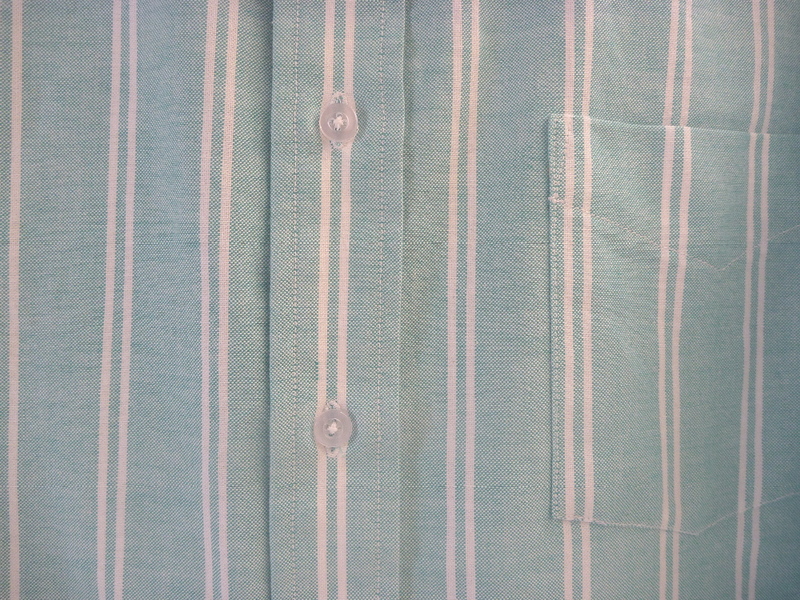 After folding and top stitching the right front, the buttons end up centered on the dominant stripe. The LEFT side of the shirt may require more thought. Remember the goal is to get the dominant stripe of the placket "stacked" directly over the same stripe on the Left front. 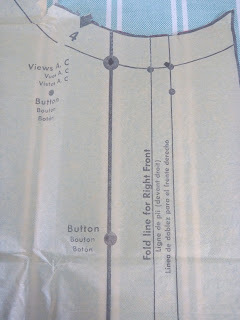 On my shirt the placket is attached to the L front with a 3/8" seam. 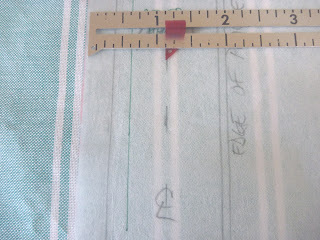 The placket is 1.5 " wide, therefore the center of the finished placket is 3/4" in from the edge. The dominant stripe is placed 1 1/8" ( 3/8" + 3/4") from the front edge of the Left front pattern piece as shown above. Now the stripes will march uninterrupted across the front of the shirt. Yay! Sadly, it can't all be matching nirvana. I can't wrap my head around matching the sleeve plackets, so I deliberately placed them on the cross grain. They would also be attractive placed on the bias. Maybe next time! Here's the back box pleat with its centered stripe. When it comes to shirts, it's all about the little details. They can be fun or they can make me want to scream. This is my third version of this shirt and I learn something each time. Mostly, I try to make things as easy as possible for myself. I concentrate most of my efforts in cutting out the pieces. 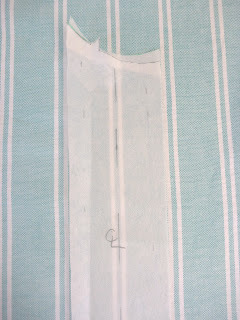 For example I set the stripe of the back yoke well in from the seam. This helps preserve the effect that it's sewn straight (which it probably isn't!) 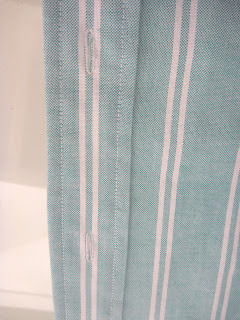 If a stripe had ended up on the seam, all my cutting and sewing imperfections would be magnified. I also did the same thing with the collar and cuffs. I hope this has been helpful. Next time I'll show the finished product. Looks wonderful to me.I could never imagine being able to get any stripe so accurately placed.Thank you for sharing and looking forward to seeing it finished! Look forward to seeing the finished shirt - your attention to detail pays off. Very nice work. I can appreciate all the details. You are inspiring me to make my first shirt. Beautiful, just beautiful!...your explanations are so clear and detail so expertly completed, your projects are the example for my efforts when I sew for my grown son. Thank you for continuing to share your projects! This looks fantastic! 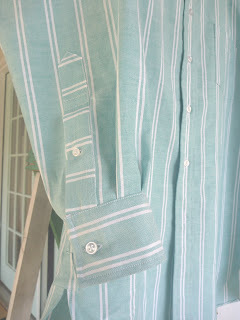 I love the horizontal stripes on the placket. I'm excited to see the finished project! Clever idea about cutting at a generous distance from straight lines in the design. I've just cut out a shirt in a floral, for a four year old boy. 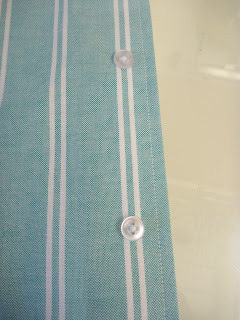 It's my first time sewing plackets. I think your horizontal placement is quite nice. You are so smart! This looks awesome, and I am very impressed with the thought you put into the stripe placement---plus it makes the buttons totally easier to place properly afterwards! Great work. The shirt looks awesome. I recently took up sewing myself and have been working on a few shirts. I had the same issues with matching the stripes. I decided to use a split yoke and had the stripes on both sides oriented parallel to the yoke/front seam. This ends up making a chevron pattern along to the yoke, but eliminates the issue of the stripes being visibly slanted on the yoke at the yoke/front seam, as well as hide any seam problems on the yoke/back seam. Oh, Blogger.....how you frustrate me! It's impossible to use you on my iPad. Thankfully there are smarter people than you who understand what bloggers need. BTW I can now respond to your comments. So if you have questions, fire away! I'm pretty much a self-taught sewist living the good life on the coast of Maine. What started as a crazy idea of making my own winter coat has snowballed into an array of men's outerwear and more. I love having the clothes that I really want. To that end -- I AM my own luxury brand! Take me to the Japanese coats!